Competition for housing is the "frontline" of a battle to prevent the far right's rise, MPs have warned. Labour MP John Cruddas and Lib Dem Simon Hughes said policymakers had failed to recognise BNP gains were linked to anger over who gets homes. Mr Cruddas said these tensions were worsening because of a "vortex" of falling wages in a "race at the bottom of the labour market". The MPs warned tensions over homes were "off the radar" of government. Mr Cruddas, MP for Dagenham, said the British National Party was on the rise because people believed immigrants got preferential treatment over housing, a perception made worse by the arrival of cheap Eastern European workers. A complete lack of reliable statistics on London's massive population upheavals meant it was impossible for policymakers to plan for sudden demographic changes, or explain them to the public. The result was a situation ripe for exploitation, he said. "This is completely off the radar of policy making," said the MP. "There is an extraordinary process of change going on. Housing is increasingly the frontline. Unless we can deal with this, we cannot deal with far right extremism. "The BNP moves in and constructs quite a sophisticated big lie that the area has been gerrymandered. We have heard things like the council is paying £50,000 to black families from Tower Hamlets to move into homes. It is very difficult to put that stuff back in the bottle." The BNP became the second largest party on Barking and Dagenham Council earlier this year after winning 12 seats. The party is understood to be presently trying to table a motion to restrict council home allocation to people born in the borough, although a spokesman was unavailable to confirm this. The BNP's website says housing policies over 40 years have meant "indigenous white working class families ... were sent to the bottom of the housing lists - so that homeless immigrants that just entered the country were prioritised for any vacant housing in the area". 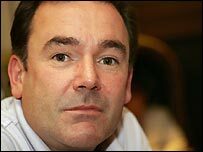 Mr Cruddas' warning at the Commission for Racial Equality's 2006 conference was backed by Bermondsey MP Simon Hughes and Andrew Kilburn, chief executive of Oldham Council. Mr Kilburn said Oldham struggled constantly to prevent the BNP convincing people that Asian families were getting preferential housing treatment. "We ignore the needs of the white population at our peril," said Mr Kilburn. "We have just had a White Paper on local government. It includes tackling extremism as an issue. Is there a link being made to housing? No there is not." Mr Hughes called for a debate over whether housing policy now needed to recognise entitlement as well as need. "Of all the issues most likely to lead to racism, housing is the issue," he said. "People feel they are not respected by the system because they have to go where they are told. If you give them a choice then you are more likely to deal with the far right." Mr Hughes said rational political debate should include questioning whether the level of entitlement to services, such as social housing, should be the same for all groups of people in society. "I don't think it's justifiable to say, for instance, that a Brazillian who arrives yesterday [with limited residential entitlement] has the same rights to social capital. I have heard Black and Asian people be the most aggressive about immigrants because of this issue."